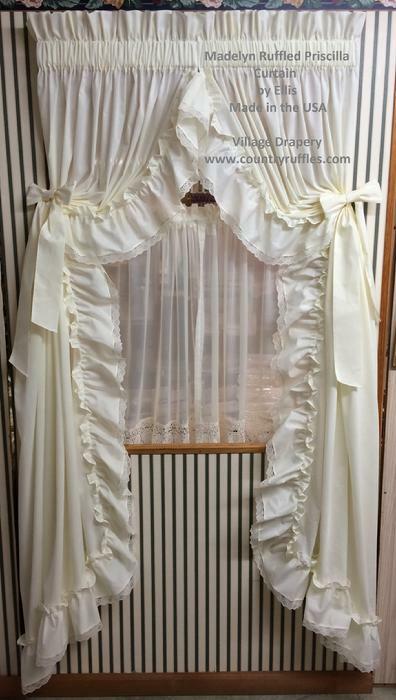 Princess Priscilla Curtains are MADE IN THE USA by Carolina Classic. Fabric is a light weight 70%-30% Poly/Cotton Blend and is machine washable. and at times we cannot ship your order as fast as we would like to. If your order is not in stock then you can expect delays upto 1 to 3 weeks on average. Please feel free to call or email to check stock if you are needing your order in a certain time frame. Princess Priscilla Curtain 90 X 63 Natural on a 40" wide window. Princess Priscilla Curtain 90 X 84 White on a 40" window. Available in Priscilla, Swag, Valance and Tier. Please allow 1 to 2 weeks for shipping for the Madelyn. Made in the USA and Machine washable cold, gentle cycle no bleach. Tumble dry low heat or hang on your window on curtain rod straight out of the washer to dry. Little or no ironing at low heat. The Madelyn Ruffled Priscilla features 1" lace on the ruffled edges. Pre-tied bows with a 3" rod pocket and 3"heading. The length is measured from the top of the heading to the bottom of the ruffle 7". Available in either WHITE or NATURAL.